Zeke’s is proud to be an official weigh station sponsor of the Alabama Gulf Coast Slam Fishing Tournament! Zeke’s will be the only weigh-in station in Orange Beach! 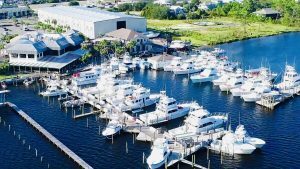 The tournament dates are April 20th – May 18th, 2019 and is open to all anglers both recreational and charter boats. There are weekly prizes as well as a grand prize, a 2019 Chevrolet truck! Each angler weighing in a minimum size fish in any category will be entered to win the truck. Anglers aboard a registered charter boat can enter/weigh-in at no additional cost above the charter fees. There are five categories: Inshore, Near shore, Reef Fish, Blue Water and Shark. There are 4 species in each category that qualify except for sharks. For the duration of the tournament, Saturdays will be designated for the shark shootout, “Shark Saturdays”. Zeke’s Annual Blessing of the Fleet is April 13th at 1:00pm. Please join us to experience this tradition that is meant to ensure a safe and bountiful season for all vessels and fishermen. Following the blessing, we will have a celebration. Complimentary food will be provided by The Hangout Hospitality Group Catering, drinks by Ghost Train Brewing Co. and entertainment by Jason Justice. This is a free event and all are welcome to attend! We look forward to seeing you there!